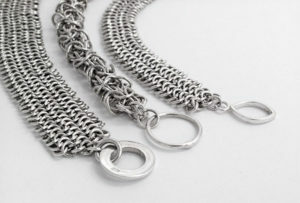 Byzantine chain, Japanese chainmail, helm weave chain and more, are chains that have been handcrafted for centuries. 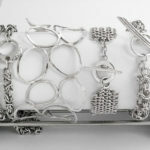 The jeweller's art and the blacksmith art share the crafting of chainmail. Many a noble's medieval, renaissance chainmail is beautifully woven in iron, adorned with etched plates and set stones. 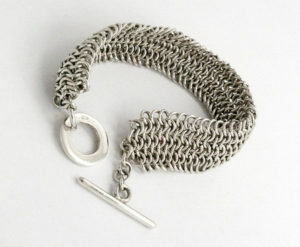 Today, we don't get calls for chain mail sweaters, but tradition chains for necklaces and bracelets are very popular. We make them in sterling silver, or gold, or copper on special request.